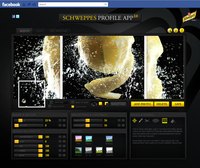 Schweppes launches Schweppes Profile App 2.0 on Facebook. Recently Facebook introduced the new redesigned profile page called Timeline to all Facebook users. This Timeline radically changed the look and feel of the profile page on Facebook. One of these changes is the cover photo, a photo at the top of your profile to express who you are and what you stand for. At the end of 2010, Facebook changed its profile page layout. 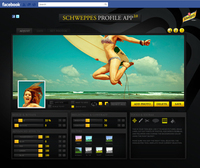 Schweppes responded to the new layout and presented the Schweppes Profile App, to help the Facebook community customize their Facebook profile. It was an instant hit, with 105.000 lifetime users. Now that Facebook improved their profile page again, Schweppes got inspired and developed a new revamped version: the Schweppes Profile App 2.0. The Schweppes Profile App 2.0 is more extensive and goes beyond the borders of the Profile App. It helps anyone who wants a unique and creative looking profile without first having to master the art of Photoshop. The app is a way to honour the users who have contributed in making the first Profile App a success . Those who are self-assured, original and have the feeling to express themselves in a creative and sophisticated way. Schweppes teamed up with the social media marketing agency Super Social, who is responsible for the concept and development of the Schweppes Profile App 2.0.